Cleveland Cavaliers point guard Kyrie Irving (left) looks over at Miami Heat small forward LeBron James (right) as Cleveland Cavaliers head coach Byron Scott (center) looks on during the second half at the American Airlines Arena. Miami won 109-105. • The Cavs play back-to-back games in Florida, and man, wouldn’t we all love to be there right now? Wintery weather aside, these are important games. The Cavs don’t have to win, but they do need to play well. Of course, wins would be better, but one thing at a time here, kids. And this trip starts with Orlando. • After the Magic, the Cavs (8-13) get Miami. Yes, LeBron James and the defending back-to-back champion Heat. Anyone who’s followed the Cavs recently knows they tend to play the Heat better on the road than at home. It seems as if James simply will not allow the Heat to lose in Cleveland anymore (for obvious reasons). One Cleveland writer predicted the Cavs would lose Friday to the Magic, then win Saturday at Miami. That actually would be kind of funny. • The Magic (7-15) don’t have loads of talent, but they do play hard and usually together. Cavs coach Mike Brown pointed out Orlando’s nice blend of youth and experience — with guys such as Jameer Nelson, Glen Davis, Nikola Vucevic and Arron Afflalo as the main veterans. No. 2 overall draft pick Victor Oladipo is also off to a strong start. Interestingly, the Magic rank 21st in the NBA in points, 21st in rebounds and 21st in assists. Defensively, they’re 23rd, allowing 101.7 points per game. • Brown then sounded a warning: “We have to make sure we’re focusing on this game and not thinking about the next (Miami),” he said. • The Magic just finished a six-game trip. They won only the final one — Wednesday at Charlotte. “We are a good team,” Davis said. “We just all got to be healthy, you know what I mean?” The Magic are indeed getting healthier. Vucevic returned Wednesday after missing four games with a sprained ankle. Small forward Tobias Harris, who’s missed all but one game this season with an injured ankle, is also probable to return Friday. He averaged 17.3 points after the Magic obtained him in a trade with Milwaukee last February. 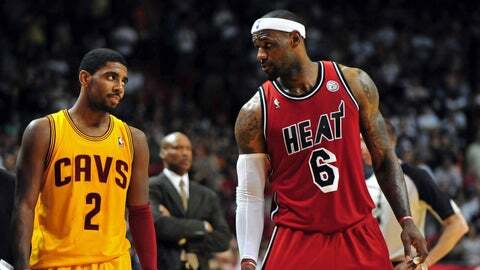 • As you know, the Cavs have won four of five and are looking closer to the team Brown envisions. Kyrie Irving was miserable (0-for-9 shooting, 0 points) in the lone loss of that stretch (at Atlanta). He’ll likely need to be at his best both nights for the Cavs to have a chance. Overall, “we need to play with more intensity (on the road),” Brown said. • Play well and lose both, and fans won’t be thrilled, but they’ll likely understand. Win one and look halfway decent in the other, and that would be better. Win both and we might just burn down the city. Not really, but this weekend will go a long way in showing if the Cavs have really improved, or if they are merely just a better team at home.